Photorelays are a type of photocouplers consisting of an LED optically coupled with a MOSFET. Photorelays offer many advantages over mechanical relays such as long service life, low-current drive and fast response. Photorelays are widely used for contact switching in semiconductor test systems, security systems, etc. 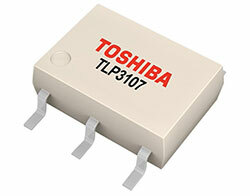 Toshiba offers low RON, low CoFF photorelays in ultra-small USOP packages for semiconductor test system applications, and general-purpose photorelays in various packages featuring high current and high off-state voltage.